5. NY Mets – The Mets seems to labour through season after season with little opportunity to succeed. Even a superstar such as David Wright can’t atone for the injuries and diseases (poor Ike) that have limited production in NYC. That being said, R.A. Dickey has shown that the ‘knuckleball’ can still be just as dominant as 100 MPH heat. 4. 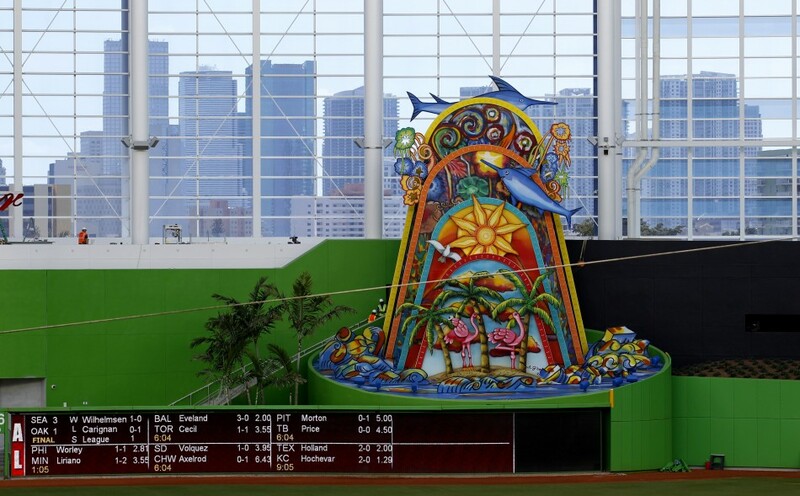 Miami Marlins – New stadium. Check. Huge free agent signings. Check. New manager. Check. Last place in the NL East. Check. You know that your team is in trouble when Showtime cancels the final episode of ‘The Franchise’ most likely because the Franchise has left for Los Angeles. As much as I would like to blame Ozzie Guillen for diminishing any chance that Miami had to compete in the East I think there is another elephant in the closet. 3. Philadelphia Phillies – The fans and the Phanatic have seen their fair share of playoff baseball. I have no sympathy for what has clearly become a franchise in rebuild. The positional players are all on the downside of their careers (Brown not included) and although they still boast a goldmine of SP’s it will be a couple of years before they are able to make a run at the Braves and Nats. 2. Atlanta Braves - The Braves have to be considered one of the best run teams in baseball. Always a competitor without a blown out budget and a roster with endless youth potential. A model citizen for the MLB. Too bad ‘Chipper’ won’t get to leave on a high note although their pitching staff will cause some problems come playoff time. 1. Washington Nationals – If you are long time fan of baseball you will remember the 1994 season that the Montreal Expos were subjected to. It was a heart-breaking experience for the Montreal franchise that seemed to continue to affect the teams move to Washington. But times have changed. Numerous poor results season after season coupled with some savvy drafts/trades/signings have put Washington back in the spotlight. The only real stumbling block for this team heading into the playoffs will be lack of experience. 5. Boston Red Sox – 175 million dollars doesn’t buy many wins nowadays in the AL East. It is hard to believe that this star studded lineup is struggling to stay out of the basement. But if there is one thing that breeds winners better than pay stubs it is comradarie, and based on recent and previous reports, that is what this club is in need of. 4. Toronto Blue Jays – You can manage an active roster but you can’t manage an IR. The Jays have suffered a number of key injuries, especially in their starting rotation, that destroyed any opportunity to contend in the strongest division in baseball. There are still a number of pieces in place for continued success moving forward so us fans can hopefully create new memories to replace the back-to-backs of the early 90’s. 3. Baltimore Orioles – In what must have seemed like an obvious boon for Orioles fans as they lead the division for the early part of the season. Of course, it is difficult to play that high level of baseball for such an extended time when the results are somewhat unexpected. However, this is not a team on the downhill portion of a slide and I would expect some future growth. 2. Tampa Bay Rays – The Rays continue to compete despite the luxury of a big market budget. The Rays tend to harvest players from the farm or turn reclamation projects into successes consistently. They are baseballs version of Pawn Stars. Not an obvious choice to make it to the World Series as a wildcard but also not a team I would want to face in round 1. 1. New York Yankees – If at first you can’t succeed, buy and buy again. Maybe I am a little jealous but you have got to respect that these guys not only put the dollars out but they make those dollars work. Although the current lineup is still better than most this team could certainly compete with just the players held up on the DL. A franchise steeped in richness just keeps getting richer. Running out of timeif they are going to make a run at the World Series though. 5. Colorado Rockies – Even Tulo and CarGo can’t atone for the mess that the Rockies starters have put forward at this point in the season. Current starters are putting up a paltry team ERA equal in value to an Arian Foster TD scramble. Ageless contributors such as Helton and Scutaro need to be moved before their value R.I.M.’s out. 4. San Diego Padres – Never a good sign when the ERA of your starters who spend half their time pitching in PETCO closely resembles the starting ERA of starters who spend half their time in Coors Field. There is some promise in some of the younger positional players but the gaps in their lineup are as cavernous as their home ballpark. 3. Arizona Diamondbacks – a couple of years away from making a real impact in the West with some solid pitching in the minors, the D’backs have some holes to fill in the middle infield (Drew’s return should help). 2. Los Angeles Dodgers – an unheralded back of the rotation has been stellar, bullpen is solid, and if Kemp can regain or maintain health their lead in the West should take a while to be overtaken. 1. San Francisco Giants – Lincecum is currently weakest starter, bullpen is strong, positionally sound and although they lack a bonafide superstar they will finish atop the West. 4. Seattle Mariners – A couple decades have passed since the heydays of Griffey Jr. and Edgar Martinez. There is lots of hope on the horizon as Seattle has some great young talent on their roster and has ample available on the farm as well. Not going to contend in 2012 however. 3. Oakland A’s – Lowest payroll in the league makes for a good big screen story but does not make for consecutive years of success in MLB. Great scouting and talent finding just not able to afford it come pay day. 2. Los Angeles Angels – This is a two horse race and looks to be for years to come. The Angels brought in two of baseball’s prized free agents and although they started slow they have been lead recently be a rookie phenom. Will make a good run for the division crown, which will endure until the final couple of regular season games, but will suffer as a result of the poor start. 1. Texas Rangers – Not a surprise they have made 2 straight World Series appearances. Best group of bats one through to nine in baseball. And although they will reign victorious in the AL West a third straight trip to the final days of October will be daunting.